The PL-6 is ideal as a remote mix controller - typical applications include acting as a simple operator-controlled fader panel in an installed sound system, or providing musicians with control over their monitor speakers or in-ear monitors. It has 8 x 60mm faders, 24 tri-colour LEDs and 16 soft switches which are all programmable via iDR System Manager. PL-6 can also act as a basic lighting controller via MIDI/DMX, and the unit can be wall-mounted or flange-mounted into a table or wall. The PL-6 is one of several remote control devices available for the iDR-4 and iDR-8 audio mix processor systems. It can be mounted into a plinth or custom furniture, or used free standing. A suitable template with cutting details is provided for custom application. The PL-6 interfaces with the Allen & Heath PL-Anet serial port. Multiple PL-6 units can be daisy chained together along with other PL-Anet devices using CAT5 cable. A terminator is provided for plugging into the last unit in the chain. The PL-6 control and indicator functions are programmed using the iDR System Manager software. Space is provided next to the controls for custom labelling. The PL-6 is ideal as a remote mix controller, for example as a simple operator controlled fader panel in an installed sound system, or as a personal musicians on-stage mix controller with in-ear monitors. The installer can program the unit according to the requirements of the application, providing the degree of control needed by the day to day operator. 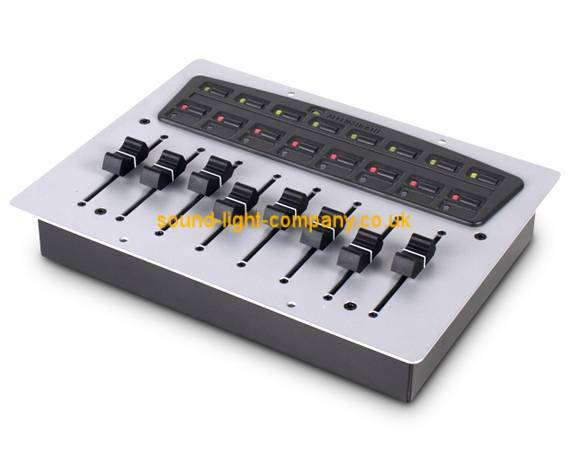 8 Faders can be configured individually for input, output, group or crosspoint level control. Minimum and maximum ranges can be set. 16 Switches, arranged as two per fader, can be configured as combinations of level up/down, mute toggle, polarity toggle, audio monitor select, or patch recall. 24 LED indicators, arranged as three per fader, can be configured as combinations of 3 colour signal meters, mute status, or patch related 3 colour LED indication. Controls can be configured as unused if not required. A single 3 colour Status LED displays PL-Anet power and communication status. Custom labels can be fitted into the recessed areas provided.